Extreame Savings Item! 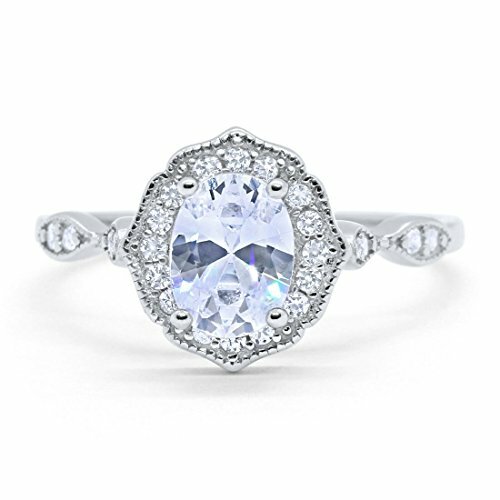 Save 50% on the Blue Apple Co. Art Deco Antique Style Wedding Engagement Ring Oval Round Simulated Cubic Zirconia 925 Sterling Silver, Size-5 by Blue Apple Co. at Femi Store. Hurry! Limited time offer. Offer valid only while supplies last. Item Specifications: Metal Type: Sterling Silver. Metal Stamp or Hallmark: .925 Metal Purity: 92.5% Sterling. Gemstone Creation Method: Simulated. Face Measurements From South To North: 12mm,Center stone 8mmx6mm.